Clean the surface of the closet or kitch before you want to stick !!! please kindly make sure you will clean the surface of the Cabinet before put on the double-sided tape , or it will not stick well. We use the best double-sided tape for this light , so normally there is no problem for most of the cabinet surface . if the surface of the cabinet is not smooth or too dirty , I do suggest you use some Silicon Fastener Clip 15mm width to secure them . 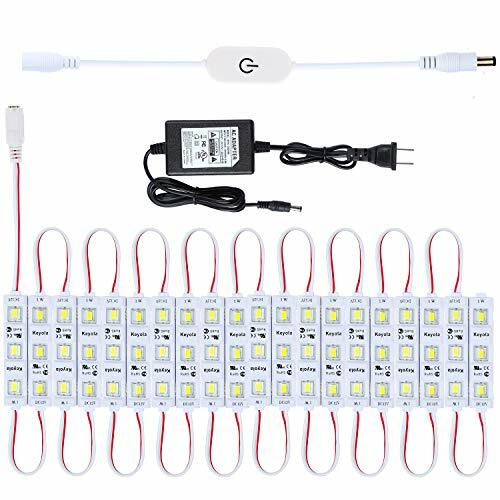 20x3leds modes light in serial ,with 0.3FT extension wire each 3leds , good encircle and decrate any shape of Under Cabinet Lights , you also can cut and shorter them,to meet your different lighting needs. No wire needed, easier to install than wired lights, super-easy double-sided tape. clean the surface of the Cabinet, peel the double-sided tape, stick to the surface and plug the power adapter, and done! where can the cabinet lights be used? The cabinet lights can be used as desk/bookshelf light , kitch cabinet light ,wardrobe light ,shoes cabinet light ,display counter light , showcase light , closet light , counter light , jewelry case light , Living room light , Bathroom mirror-front lighting ,Cosmetic Mirror/Vanity Mirror light ,etc. Easy installation: No wire needed, easier to install than wired lights, super-easy double-sided tape. clean the surface of the Cabinet, peel the double-sided tape, stick to the surface and plug the power adapter, and done! Dimmable LED Under Cabinet Lighting :With a handy dimmable touch switch, the lights can be easily turned on and off and dimmable.Touch sensor switch on the dimmer, turning LED lights on/off whenever you want. Press and hold button for several seconds, you can dim the lights. super bright 2400Lumen 5630 led with injection brushed cover , to protect your eyes. LED Bulbs Lasts 10+ Years (50000 hours), with 3 years quality warranty for the light . Flexible to Use, good encircle and decrate any shape of Under Cabinet Lights: 20x3leds modes light in serial ,with 0.3FT extension wire each 3leds , good encircle and decrate any shape of Under Cabinet Lights , you also can cut and shorter them,to meet your different lighting needs. If you have any questions about this product by Keyola, contact us by completing and submitting the form below. If you are looking for a specif part number, please include it with your message.